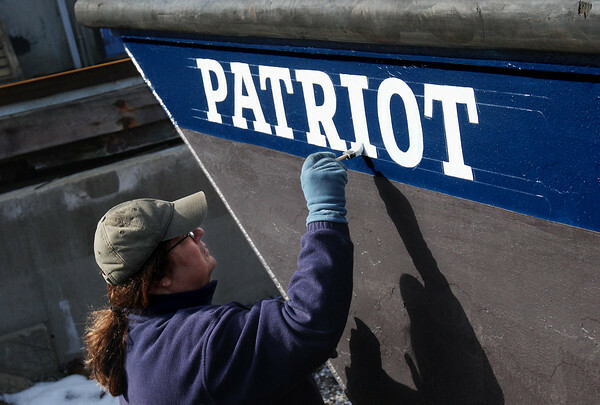 Cheryl Newman-Lahti of Gloucester paints the name onto the bow of the Patriot, a barge owned by Smith Marine Company that was being serviced Monday at Gloucester Marine Railways on Rocky Neck. Newman-Lahti, owner of Cheryl's Signs, does most of her hand-lettering work on boats from Spring through Fall. "I have to give it two coats of paint this time of year," she says, "otherwise the paint will run."